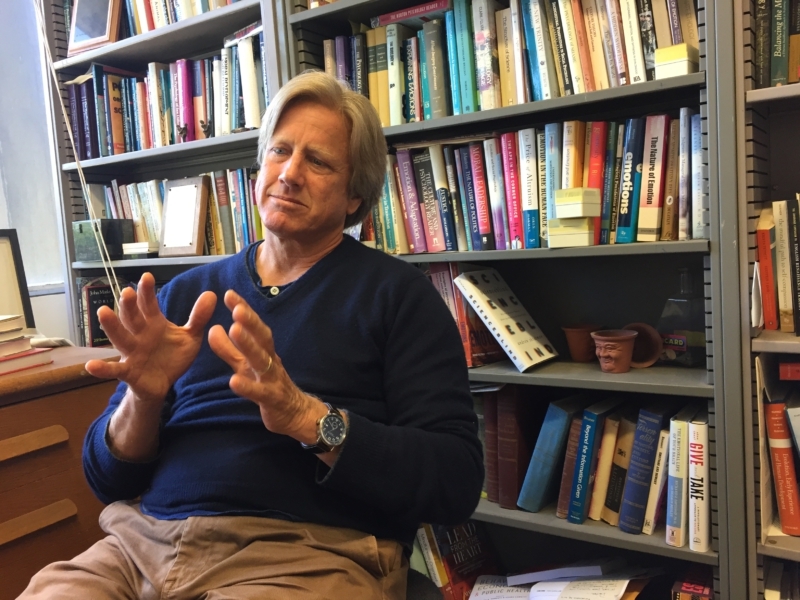 The “science” of happiness may sound like an oxymoron to most people, but not so Dacher Keltner, psychology professor and director of the Greater Good Science Center (GGSC) at UC Berkeley. For the past three decades, he has been researching human emotions, starting with micro-movements of facial muscles and more recently the relationship between powerlessness and health outcomes. Along the way, he has written several books and co-created one of the most popular MOOCs (massive open online courses) in the country. Keltner began studying psychology just as the field was transitioning away from a belief that all human decisions were based on rationality and facts (the brain as computer model), and toward the “emotion revolution.” The “explosion of interest in feeling” fit in with Keltner’s own family belief system, and he quickly found his niche. “My mother, an English professor and student of Romanticism, and my father, an artist guided by Lao Tzu and Zen, cultivated in me the conviction that our best attempts at the good life are found in bursts of passion,” he writes in his book Born to be Good: The Science of a Meaningful Life. He started out “reading faces” as a post doc in the lab of Paul Ekman — made famous by the TV series Lie to Me — spending over 2,000 hours analyzing frame-by-frame video images of facial expressions in order to map different micro-emotions. “When I first heard about this, it was like an intellectual epiphany,” he said. It validated what he had learned about emotions, and provided a scientific way of measuring something that otherwise seemed ineffable. Ekman claims that micro expressions cannot be hidden, even when a person is trying to conceal an emotion. By learning Ekman’s coding system, Keltner said, he entered a different “perceptual world … It’s the world before language, the way our primate predecessors communicated. Darwin was interested in this. It’s mind-blowing to be exposed to it.” While Ekman only studied six emotions at his UC San Francisco lab, Keltner eventually added another 15 emotions to the mix, including awe and compassion. “The connection between happiness and the greater good is pretty clear, and it’s under-appreciated,” he said. There is more to happiness than momentary, individual pleasure. “Social connection is one of the strongest determinants of health,” Keltner said. “We take a lot of happiness in giving to other people.” In fact, research shows that lonely people die younger than people with strong social networks. “Lonely college students had higher blood pressure than non-lonely ones, putting them at greater risk for heart disease, and this health disparity was even greater between lonely and non-lonely older adults,” according to an article in the Greater Good magazine. GGSC was founded in 2001, with a gift from Berkeley alumni Thomas and Ruth Hornaday. After their daughter died of cancer, and soon after 9/11, the couple called Cal’s Dean of Social Sciences and said they wanted to create a center “that would really bring peace to people,” Keltner said. The dean, Geroge Breslauer, knew of Keltner’s work and referred the Hornadays to him. In addition to a website with information for the general public, GGSC also has a portal devoted to gratitude, and another website featuring research-based practices and specific instructions for developing those “greater good” practices. Regardless of the name, there seems to be a real hunger for the information offered by the GGSC. While the original Greater Good print magazine had 5,000 subscribers, the online edition now has nearly six million unique visitors a year, according to Marsh. “What has been most gratifying to me is hearing from individual people who tell us how the material has made a difference in their own lives,” Marsh said. The Center has created specific programs to take these practices into schools, health care settings and even prisons. “We heard from a social worker in a maximum security prison in California who is incorporating our lessons into work she is doing with prisoners and violent offenders,” Marsh said. “She is doing pre- and post-assessments, and finding reductions in prisoners’ feelings of aggression and depression levels.” Educators and health care providers have submitted similar reports, he said. The Center was started with a $1 million gift, and 16 years later the annual budget has grown to $2.5 million. GGSC does not have its own building, but operates out of about seven “tiny offices” that are part of an old pre-school on the Berkeley campus, Keltner said. “Our infrastructure is underwhelming,” he said, adding that the money goes toward staff and programming. Keltner himself works out of a closet-sized office in the psychology building. Keltner wrote the short book in 2016, before the election of Donald Trump, and there is some cognitive dissonance in reading the first 100 pages in a post-election world. Keltner writes about a “new science of power,” which posits that only socially intelligent, caring and compassionate people ultimately become leaders. His book revolves around 20 “Power Principles” such as “enduring power comes from empathy” and “enduring power comes from telling stories that unite,” and “groups give power to those who advance the greater good.” It is hard to connect those concepts with current reality. Keltner had originally written a longer chapter on coercive Machiavellian power for the first draft of the book, “but in the spirit of collective optimism we cut it,” he said. “If I were to write the book now, I would say that human societies are an interesting combination of coercive, manipulative, aggressive power and prosocial and connective power.” The book has been translated into 12 languages. Meanwhile, Keltner continues to explore practices related to the “greater good.” He volunteers at San Quentin a few times a year; works with national health care executives to incorporate GGSC practices into health care settings; and continues to teach and spend time with his family. He also tries to spend as much time as possible outdoors, especially in places that evoke awe in him, such as the high Sierras. “Sometimes it takes a while to figure out who you are,” he said. He loves backpacking and camping and sleeping outside. “I don’t mind bears running around,” he said. Happiness, it turns out, can be found in unexpected places.